Rossi learned Monday evening that his victory was worth $2,548,743 from an overall purse of $13,273,253. Rossi _ whose winnings include $50,000 for Sunoco Rookie of the Year honors _ coasted across the finish line on an empty fuel tank in his No. 98 NAPA Auto Parts/Curb Honda for Andretti Herta Autosport with Curb-Agajanian. Rossi beat Andretti Autosport teammate Carlos Munoz by 4.4975-seconds, treating a sellout crowd in excess of 350,000 to one of the more improbable finishes in Indy 500 history. Rossi, who led 14 laps, is the first rookie winner since Helio Castroneves in 2001 and first American-born rookie champion since Louis Meyer in 1928. Alexander Rossi sealed his magical Month of May with a kiss on Monday. for media opportunities in New York City on Tuesday and the Dallas-Fort Worth Metroplex on Wednesday. Rossi admittedly shocked himself, his Verizon IndyCar Series peers and the motorsports world in general by parlaying a fuel-conservation strategy into victory after 200 laps around the 2.5-mile IMS oval. A road-racing specialist with Formula One aspirations, Rossi joined co-owners Michael Andretti and Bryan Herta on Feb. 23 after losing out on a fulltime ride with Manor Marussia F1 Team. Three months later and with one oval-track result on his resume, Rossi won the crown jewel of domestic open-wheel racing in only his sixth series start. In doing so, Rossi believes he answered several lingering questions. “Well, I think there was huge question marks, rightly so, over me and IndyCar and specifically oval racing, having absolutely zero background,” Rossi said during his latest news conference at IMS. “We all know it’s a different kind of animal, if you will, in terms of the motorsports world. Munoz, who led 10 laps including Laps 194-196 before pitting for fuel and surrendering the lead to Rossi, earned $788,743 for his runnerup effort in the No. 26 Andretti Autosport Honda. Josef Newgarden drove the highest-finishing Chevrolet, taking third and earning $574,243 in the No. 21 Ed Carpenter Racing entry. He led 14 laps in what was his best finish in five Indy 500 starts. Tony Kanaan, the 2013 Indy 500 champ, led five times in the race’s second half for 19 laps overall in an event that featured 54 lead changes among 13 drivers. Kanaan earned $445,743 in the No. 10 Chevrolet fielded by Chip Ganassi Racing Teams. Rounding out the top-five was Charlie Kimball, the only driver among that group to not lead a lap. He earned $423,243 in the No. 42 Chevrolet for Chip Ganassi Racing Teams and now has logged four top-10 finishes in his last five Indy 500s. Pole-sitter James Hinchcliffe led 11 times for 27 laps, his fourth consecutive 500 with laps-led. The Canadian won $502,993 in the No. 5 Schmidt Peterson Motorsports Honda, which included the $100,000 Verizon P1 Award. Ryan Hunter-Reay, the 2014 Indy 500 champion, led the most times (15) and the most laps (52) but could only muster a 24th-place finish after a pit road incident on Lap 117 with Andretti teammate Townsend Bell and Team Penske’s Helio Castroneves. RHR earned $419,243 in the No. 28 Honda. Two-time/defending champion Juan Pablo Montoya was the first driver out of Sunday’s race after a Lap 64 crash. JPM earned $339,493 in the No. 2 Team Penske Chevrolet. 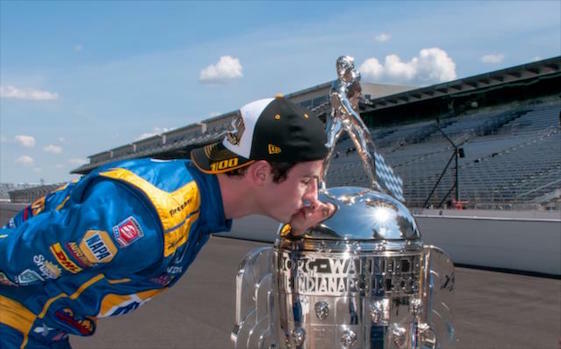 _ Alexander Rossi is the 10th rookie driver to win the Indy 500. The others are Ray Harroun (1911), Jules Goux (1913), Rene Thomas (1914), Frank Lockhart (1926), George Sounders (1927), Louis Meyer (1928), Graham Hill (1966), Juan Pablo Montoya (2000) and Helio Castroneves (2001). Meyer drove relief for Wilbur Shaw in 1927. _ The 14 laps Alexander Rossi led ties 1920 winner Gaston Chevrolet for the seventh fewest laps-led by a race winner. It also is the second-fewest by a rookie champion, as Graham Hill led 10 laps in 1966. _Alexander Rossi is the third driver to win the race from the 11th position. Gordon Johncock did so in 1973 as did Helio Castroneves in 2001. _This is the fourth time car No. 98 has won the Indy 500. The others were driven by Dan Wheldon (2011), Parnelli Jones (1963) and Troy Ruttman (1952). 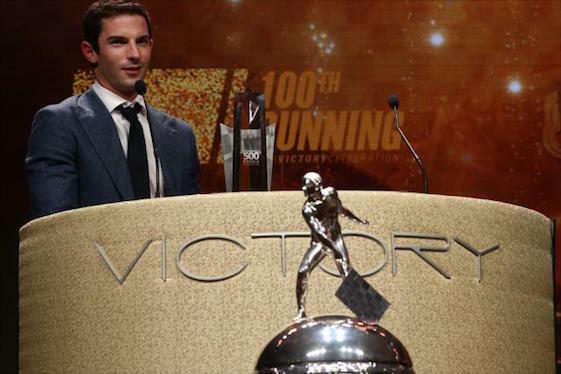 _ Led by Alexander Rossi, the five rookies in the 2016 field raised the total to 763 different drivers who have started the 100 Indy 500s. Four-time champion A.J. Foyt Jr. started against 240 of those drivers during his record-setting 35-year career (1958-1992) of competition.